Following new iPhone releases, the devices are always subjected to a range of durability tests, and the iPhone XS and XS Max are no exception. Over the weekend, warranty company SquareTrade conducted several tests on the two new smartphones, checking Apple's claims of IP68 water resistance and more durable glass. According to Apple, the iPhone XS and XS Max are using "the most durable glass ever in a smartphone" and have improved IP68 water resistance, meaning they can withstand water up to two meters deep for approximately 30 minutes. In SquareTrade's tests, the two iPhones stood up well to liquids, but the more durable glass didn't prevent them from shattering when dropped. Both the iPhone XS and XS Max survived the extended beer bath and were entirely operational afterwards, confirming Apple's water resistance claims. 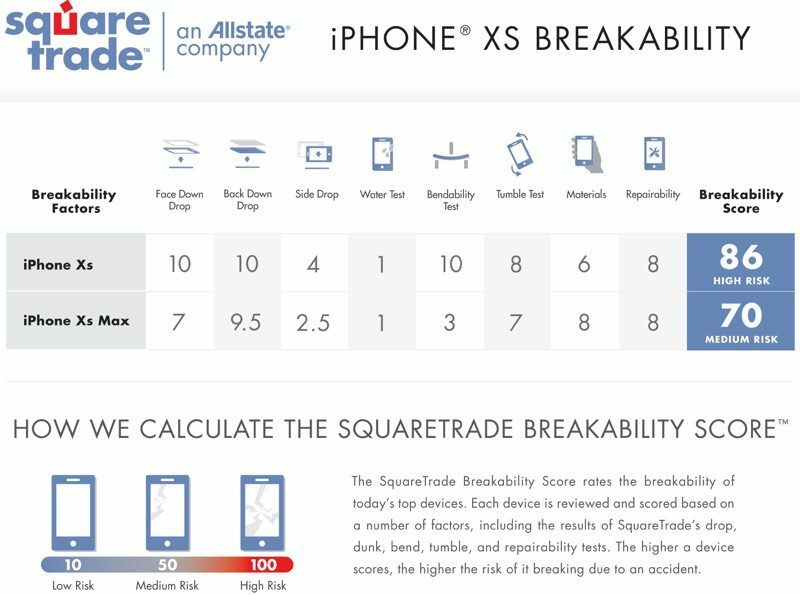 SquareTrade assigned each iPhone a "Breakability Score" taking into account performance on each of the tests, as broken down in the image below. iPhone XS earned a Breakability Score of 86, classified as "high risk," while iPhone XS Max earned a Breakability Score of 70, classified as "medium risk." "We were super impressed with the iPhone XS Max, which is much stronger than its discontinued predecessor, the iPhone X. However, as with the iPhone X, our tests show the all-glass design of the iPhone XS and XS Max make them highly susceptible to cracking, particularly from drops, the most common cause of damage, said Jason Siciliano, vice president global creative director at SquareTrade. "Repair costs for the new iPhones are expected to be around $399 to replace a front screen and $599 to replace a shattered back. Considering $599 was the cost of the most expensive version of the very first iPhone, repair costs are now something to consider when buying a new iPhone. They're beautiful phones. Just hang on tight." As with the iPhone X, non-warranty repairs for Apple's all-glass devices are expensive. Without AppleCare+, getting the screen replaced on the iPhone XS costs $279, while a screen repair for the iPhone XS Max costs $329. Damage to the back of the device falls under the "Other repairs" category, which costs $549 for the iPhone XS and $599 for the iPhone XS Max, making AppleCare+ or a sturdy case a good idea. I think six feet is an odd height to use for testing a phone drop. Very few people hold their phones over their head before they drop them. That is the biggest concern for me. I buy an $1099 phone and I am expected to paid $549 when the back glasses broke? I mean the TCO ( Total cost of ownership ) has literally double or more from the iPhone 7 Plus era two years ago. You can buy an $199 Apple Care+ which pushes the phone to $1298, and for $256GB that is $1448. I often wonder, at what sort of salary range are Apple targeting for iPhone Xs? I don't get it. A company which sells insurance for iPhones and so on, "tested" a device to prove that it breaks easily, meaning that probably you should insure it? Isn't this a bit like when tobacco companies used to claim that smoking was good for your health, or am I missing something here? I've owned 7 iPhones to date and never so much as scratched a single one. All were resold in pristine condition. I've probably jinxed myself now. They said 'the most durable' not the 'most durable unbreakable glass'. Drops are never regulatory. It’s all based on angle, impact and surface type. There are so many variables and instances where a drop can affect a phone, someone may drop their phone from 6 feet and it could survive and someone else might have the opposite experience, its All based on how it landed and the other variables mentioned above. Once again, glass breaks....who'd have thunk it! On a side note, don't you need to do this test more than once to determine the result? If 5 identical phones all suffered the same consequences (no doubt they would being glass) doing exactly the same tests you have your evidence.